Here I list some of my more recent projects. The projects range from a wearable device teaching users to play piano, a user interface to generate gesture recognizers that show a low false positive rate and a project on dolphin communication. If you want to know more then provided on this page please check my CV for more information or directly email me. 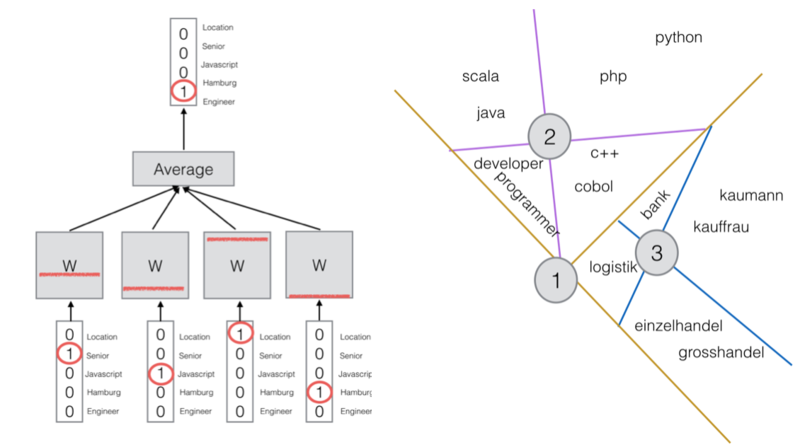 Especially if you are interested in code or data for the experiments. The wearable computing experiment aims to establish a two way communication between humans and dolphins. 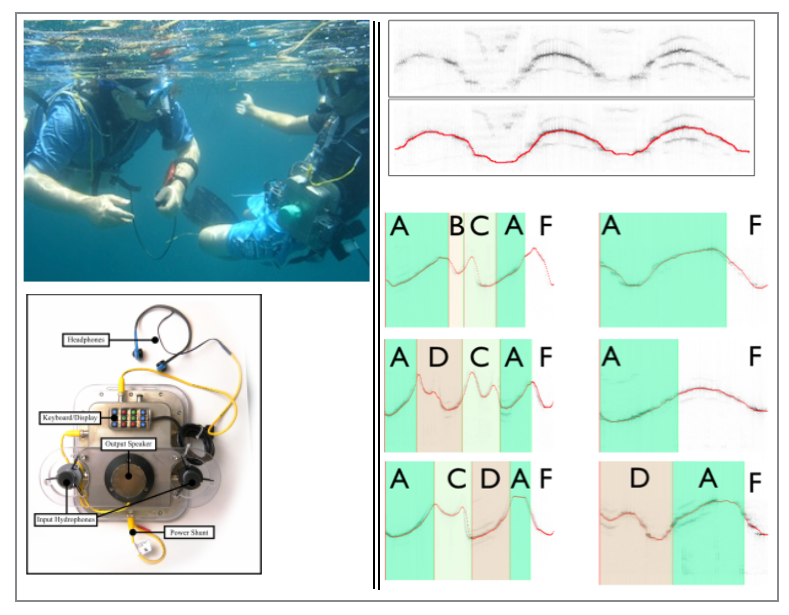 A researcher can wear a diving computer capable of playing artificial dolphin whistles designed by us and recognize these back. Two divers will wear a computer underwater with the dolphins and pass an object back and forth. Whenever they pass it, they will play an artificial whistle associated by us with the object. The hope is that the dolphins will mimic the sound whenever they want an object, too. For more information on this work please see the ISWC 2013 paper. 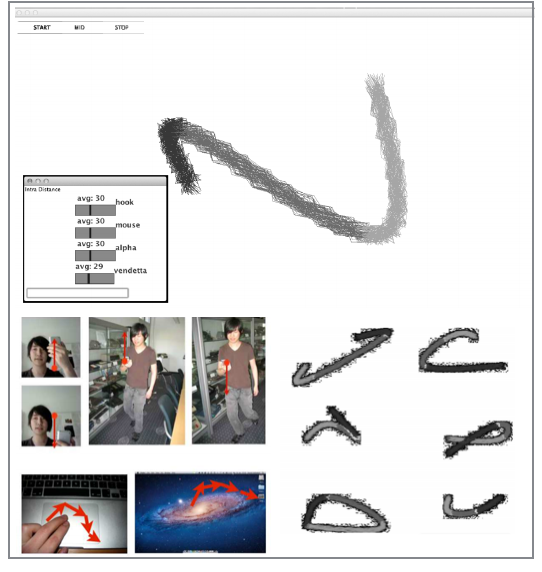 Gestures for interfaces should be short, pleasing, intuitive, and easily recognized by a computer. However, it is a challenge for interface designers to create gestures easily distinguishable from users' normal movements.Our tool MAGIC Summoning addresses this problem. Given a specific platform and task, we gather a large database of unlabeled sensor data captured in the environments in which the system will be used (an "Everyday Gesture Library" or EGL). The EGL is quantized and indexed via multi-dimensional Symbolic Aggregate approXimation (SAX) to enable quick searching. MAGIC exploits the SAX representation of the EGL to suggest gestures with a low likelihood of false triggering. Suggested gestures are ordered according to brevity and simplicity, freeing the interface designer to focus on the user experience. Once a gesture is selected, MAGIC can output synthetic examples of the gesture to train a chosen classifier (for example, with a hidden Markov model). If the interface designer suggests his own gesture and provides several examples,MAGIC estimates how accurately that gesture can be recognized and estimates its false positive rate by comparing it against the natural movements in the EGL. For more information see the JMLR or Face and Gesture paper. Mobile Music Touch (MMT) helps teach users to play piano melodies while they perform other tasks. 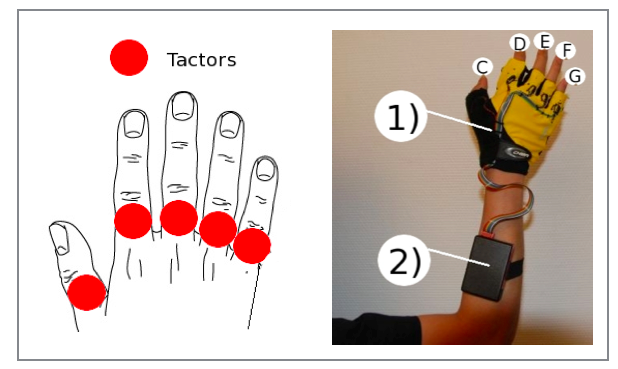 MMT is a lightweight, wireless haptic music instruction system consisting of fingerless gloves and a mobile Bluetooth enabled computing device, such as a mobile phone. Passages to be learned are loaded into the mobile phone and are played repeatedly while the user performs other tasks. As each note of the music plays, vibrators on each finger in the gloves activate, indicating which finger is used to play each note. We present two studies on the efficacy of MMT. The first measures 16 subjects' ability to play a passage after using MMT for 30 minutes while performing a reading comprehension test. The MMT system was significantly more effective than a control condition where the passage was played repeatedly but the subjects' fingers were not vibrated. The second study compares the amount of time required for 10 subjects to replay short, randomly generated passages using passive training versus active training. Participants with no piano experience could repeat the passages after passive training while subjects with piano experience often could not. For more information check the CHI2010 or ISWC2010 paper.